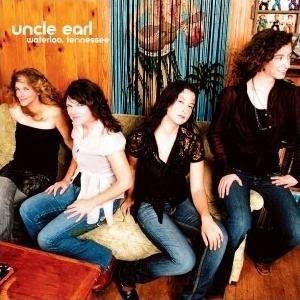 Uncle Earl put on a great performance Sunday at the Birchmere in Alexandria, Va., a place they proclaimed as one of their favorite venues in the country. It's a place they attested they wouldn't miss their show, no matter how much trouble they had getting there, as they hilariously described for the audience between songs. The all-female string band's set list was comprised of songs from the members' side projects and their two collaborative albums, the second of which was produced by John Paul Jones and also includes the Led Zeppelin musician on mandola, bass, piano, Papoose, wobbleboard, and a fair amount of background hollering. What's really wonderful about this band is their versatility. Each g'Earl is proficient at her instruments -- Rayna Gellert on fiddle, Abigail Washburn on banjo, Kristin Andreassen on guitar, fiddle, harmonica, banjo and ukulele, and KC Groves on mandolin, guitar and mandola -- and each can sing. They trade off lead vocals from song to song, and their other individual talents, including Kristin's dancing and Abigail's keen sense of fashion, are all highlighted eventually. Onstage, they obviously displayed the same "enthusiasm, willingness and fine musicianship" to which Jones alludes in the liner notes to their March release, Waterloo, Tennessee. At the Birchmere, Uncle Earl was joined onstage by the six-member King Wilkie, which Kristin proclaimed to be the object of her affection. Both groups are signed to Rounder Records. Several members made cameo appearances throughout Uncle Earl's set, and touring addition Laura Cortese played upright bass throughout it all. One unexpected treat was a cover of the Police's "Canary in a Coalmine" in a nifty arrangement that could have been made by Rolf Harris. Another standout number can be found on Kristin's solo effort, Kiss Me Hello: "Crayola Doesn't Make a Color for Your Eyes." It's a children's song she cowrote and for which she won a songwriting contest earlier in the year. Immediately at the chorus, many audience members let out a noise that signalled either they had just recognized the song ("ahhhhh") or they thought its lyrics and harmonies were absolutely charming and angelic ("awwwww"). The song also benefited from Kristin's playful pattycake with Rayna, four-part harmony from the g'Earls, and a toy piano solo from King Wilkie's Reid Burgess. Uncle Earl's set concluded with an ensemble jam on the g'Earls' arrangement of the traditional "Black-eyed Susie." After the show, I asked the gorgeous Rayna whether her group has taken a cue from Jones and enlisted Andy Manson in England to make them any acoustic stringed instruments. Rolling her eyes, she said, "I wish!" His equipment is a little pricey for the group, she suggested. One of Jones's instruments, a mandocello, is so large that she calls it the "water buffalo," she said, and it makes her jealous. Then she really made me jealous. Kristin and Rayna said they have one more show in the United States this road trip and that Uncle Earl will be touring England this November. Their tour dates will end in time for the Led Zeppelin reunion concert in London on the 26th. Any plans to attend? First, Kristin stroked her chin and teased, "We'll see." Separately, Rayna's answer, however, was more direct. Maybe she doesn't have a water buffalo she can call her own, but she confirmed that indeed all of her band would be special guests of John Paul Jones at the Led Zeppelin show. Now who's jealous? Comments are moderated prior to publication. Comments will not be published if they are deemed vulgar, defamatory or otherwise objectionable. The correct bassline that inspired "Black Dog"
How feasible is Nov. 26? Every day is a Zeppelin day. Please consider a donation today to support Lemon Squeezings! © Copyright 2013 Steve Sauer. Picture Window theme. Powered by Blogger.